Architects Foster + Partners have completed a production centre for British sports car brand McLaren. The facility has wide spans offering maximum assembly space while the basement is used for storage and machinery and a mezzanine offers a view of the production line. High-performance sports cars are manufactured, painted and tested on a linear production line that dictated the building's rectilinear form. The McLaren Technology Centre's curved surfaces and horizontal aluminium cladding reference the existing buildings on the site in Woking near London. An underground tunnel will link the production centre to the McLaren Technology Centre, which was also designed by Foster + Partners. Trees screen the building from the nearby road and the whole structure is sunk into the incline of the site, reducing its visual impact on the landscape. Foster + Partners recently completed another transport facility – the world's first commercial spaceport – and also unveiled a proposal for a massive transport hub in the Thames. See all of our previous stories on Foster + Partners. All photography is from McLaren. The drawings below are from Foster + Partners. The McLaren Production Centre is the second building designed by Foster + Partners at McLaren’s rural site on the outskirts of London. 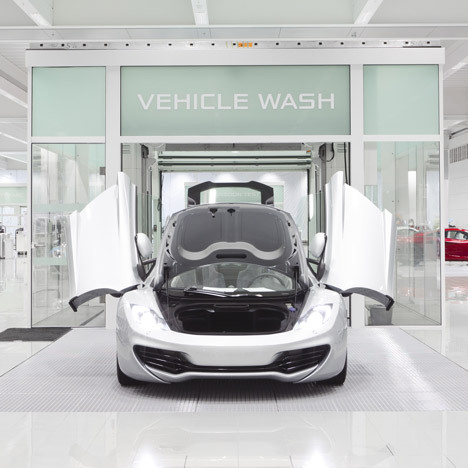 The 34,500-square-metre facility is intended for the manufacture of a range of high-performance road cars and is located to the south-west of the existing McLaren Technology Centre. The two buildings will be connected by a subterranean walkway, lined with interactive exhibition spaces. Sharing a common language of details and materials, the new building is clad in aluminium tubes, the rounded corners of its rectilinear plan reference the curves of the Technology Centre and the entrance, echoing the existing building, is a circular glass drum beneath the overhang of the roof canopy. Iwan Jones, a partner at Foster + Partners, said: “Our intention was to design a new kind of industrial building, which would be an elegant addition to the McLaren Technology Centre. The two buildings are physically connected by a 100-metre- long tunnel and unified by a common architectural language – we established a ‘kit-of-parts’ system for the project, a family of finishes and details. By optimising structural spans to allow a largely clear floor space, we have essentially created a big empty box, with services integrated within the structural zones, wall and floor voids.